The weather was partly cloudy today in Kyoto. 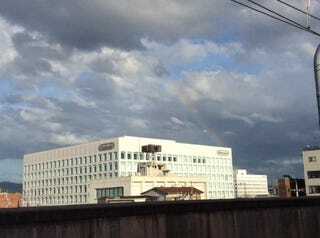 But through the clouds, a rainbow was apparently spotted in the sky over Nintendo’s headquarters. This photo, snapped by Twitter user Bakatetu2, was taken from Jujo Station in Kyoto. The lede photo was taken by Twitter user Kaorin1211’s husband.